Zippers are something I feel like I'm not especially good at, so I decided to practice by making a zipper pouch. I have a large zipper collection (why? who knows) and this was an exceedingly easy project so there may be a few more of these in my near future. I love to have a few around for gifts and pencils and the doodlebug seems to enjoy sorting things into them almost as much as I do. I used Toni Coward's (of Make it Perfect) zipper pouch tutorial. I didn't do the embroidery or other embellishments this time, just some patchwork for the front piece. This tutorial is well-written and well-photographed and way easy. Seriously took me about 30 minutes to put together (I had already done the patchwork earlier during the day - that was probably another 30 minutes to iron, cut and sew all the pieces to get them ready). And since I finally figured out which foot is the zipper foot (yeah, duh, I know) it was a breeze to put together! A little quality assurance check by my supervisor - thankfully it passed her inspection. I have literally never had a tougher boss! Table runner? What table runner? Ok, I'll admit it - I love the patchwork part of quilting waaaaay more than the quilting part of quilting. So I'm distracting myself with food and easy (read 1-nap) projects. Wrong? Probably. But tasty and oh so satisfying! I found the easiest and tastiest ham and cheese quiche recipe and I thought I'd share - and if I post it here, I'll always be able to find it. 1 1/2 c. shredded cheese and 4 tsp. flour - toss these two together and put in the bottom of the pie crust (really any kind of shredded cheese will work). 3 eggs and 1 c. milk - mix together and pour over the ham/cheese layers, then I always throw a little extra cheese on top ( you don't have to but it helps give it a nice GBD top). I leave the salt out but you can include 1/2 tsp. if you want, we just salt and pepper to taste at the table. Bake at 400 degrees for about 45 minutes, until golden brown and the top is completely set (you can always check with knife inserted in the top, should come out clean when done). The ball is a project I've been wanting to make for the doodlebug for a while. I have a ton of scraps and if you google fabric ball you can find a million tutorials for them, and they all seem similar, 6 leaf shape pieces (I drew mine on a piece of xerox paper and it was about 9 inches long for this size ball) sewn together, turned inside out and stuffed. Voila! So because the doodle is really into balls of every size, shape and color I wanted to make her a set of color wheel balls. This one is my scrap fabric trial run and I love how it turned out! It really was super easy - start to finish about 45 minutes. Not being a big football fan I was psyched to enjoy a couple of hours of sewing time last night while my dear husband was tortured by the Falcons. I was looking for something that I could start and finish in one evening and Ashley's pillowcases were just the ticket! I love her tutorials, they are always clear, well-photographed and well-written. I actually bought the fabric for these back in November at Whipstitch Fabrics but just got around to making them. It took about an hour and half for both, which was ideal. Here are the finished cases on the bed, Grace really likes them but of course she has to act all aloof. Typical feline. These pillowcases look great - I love the contrasting trim and cuff. The other nice detail that Ashley includes (and makes really easy) are french seams, which kept these from faring when I threw them in the wash - love that. I LOVED actually finishing something - so often I start things that seem to drag on and on - but this was quick, easy and oh so satisfying! Tomorrow back to the table runner so it doesn't become one of the many UFO's in my life. But tonight sweet dreams on something checked off the list. Aaahh that feels good. Okay so after FIVE snow days (FIVE! - which has NEVER happened in Atlanta before) here's my table runner progress. Top and bottom are pieced and ready to be sandwiched, pinned and quilted. It was kind of torturous to not be able to just sit and sew all day every day this week because it would have been THE most perfect week for that. But a certain small someone was not down with that plan, so I made do sewing during naps or at night. It was the first sewing I've done in the new craft room and it felt AWESOME! As soon as I get this sandwiched I'm going to practice my free-motion quilting on this - just squiggles - nothing fancy but I need all the practice I can get and I figure better to practice on something I'm not in LOVE with. Don't get me wrong, I like this just fine but it's not fabric that's precious to me in any way, so I can practice on it and not feel bad when it looks like a third grader quilted it (no offense to any third graders). So what have we been up to this icy week trapped indoors? LOTS of baking and in hindsight it probably wasn't the best idea to combine all that baking with a week straight of pajama wearing but oh well, too late now! We sorted, flung and bagged up all sorts of goodies, the pantry and spice cupboard have been sorted and rearranged at least a dozen times and we've gone from wobbly walking to almost running. Yesterday we finally got up the nerve to take a walk around the block and didn't fall even once! I'll leave you with my little snuggle-bug all dressed for the COLD - isn't she cute?! Now, thankfully I can hear the ice melting like rain in the gutters and we're hopeful today is the day we BUST out of this joint! Come on Friday lunch OUT - I'm more than ready for a meal I haven't cooked myself. Next week - a finished table runner and a new crib quilt for the doodlebug! It started snowing last night around 8PM and it came down in fat flakes that collected everywhere with amazing speed. I loved watching the huge lacy flakes as they flew through the street lights. So this was the scene this morning when we woke up, and more freezing rain is falling making a nice shell over all this snow. I don't think we'll be going anywhere today (or maybe even tomorrow from what the weather people are saying). We're pretty well stocked up - except for yogurt (eek! breakfast emergency!) so I think we'll be just fine. Maybe a little stir crazy but fine. What are the odds that this wild child entertain herself quietly and completely while I sit and sew? Ah well, a girl can dream. I'll just have to hold on till naptime. 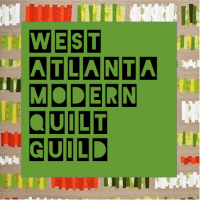 Then I'm going to work on the table runner I cut out at the sewing circle/Atlanta Modern Sewing meeting at Whipstitch on Saturday. The colors aren't the most modern but I wanted to use a "practice" fabric before I cut in to my good stuff. Surely I'm not the only one who does a practice run first? Oh and check out the new bangs on the doodlebug - I cut them myself (thanks Aunt Kristy for the advice on how-to) and I think they turned out pretty well. But then again I think she's just pretty all-around CUTE!! Here's the start of the table runner - pieces all cut and laid out, ready to go. The original pattern called for 3 of these blocks but since our table is so long I think I'm going to make 5 or 6. The pattern is called Box Lunch Table Runner (seems like a bento box) and it's from the On a Roll Again booklet from Heather Peterson. It's a small booklet but it has some great jelly roll patterns for quilts and a variety of table runners. My goal is to get this finished this week - check back and see how I do!